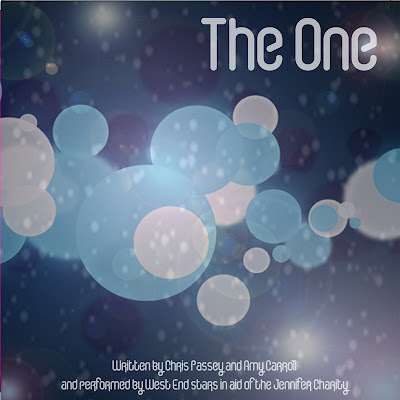 The One is a very special Christmas charity single recorded by West End artists and a choir of up-and-coming musical theatre performers, in aid of ‘Jennifer Charity’. Jennifer Charity was founded by James and Graham Edgington, father and son, following the death of Jennifer in 1985. Graham was left as a single parent of a 16 month old baby and not only did he have the pressure of bringing up James alone, he had to find his own time to grieve and work a full time job. Twenty-five years later James has extensively researched widowed fathers and was alarmed at the lack of supportive organisations aimed at widowers in particular. There are exceptional bereavement charities and organisations helping single parents often single mothers but nothing for men. James decided that he wanted to set up this charity as a support mechanism for widowed fathers and of course, importantly, the children affected by these circumstances. The 99p single will be released on the ‘Big World Theatre Company’ label on Friday 2nd December exclusively through BritishTheatre.com and then via iTunes a week later on Friday 9th December. Big World Theatre Company was formed in 2009 by Artistic Director Amy Carroll. Their first production was a new musical theatre initiative for the West Midlands called The Lyric Exchange. It featured brand new writers and performers from the region and showcased the work of composers Chris Passey and Tim Prottey- Jones, amongst others. More recently, Big World published and released 'Self Taught; Still Learning – The Music of Chris Passey' featuring the best in the West End in aid of MS and Cancer Research UK. The album has achieved huge support and following its release Big World are delighted to have published and released this song.